What’s the story with Instagram Stories? When Instagram Stories first launched, it drew an immediate comparison to Snapchat. But several years later, not only has Instagram made Stories its own – it’s given people and brands a whole new way to interact with the platform. Instagram Stories are watchable videos and photos that expire after 24 hours. Recode put it best when they said that Instagram Stories has provided a way for users to stay active with Instagram and share content that might not be “Instagram-worthy” on the curated feed, but is share-worthy. But this feature isn’t just good for ‘grammers who want to share the concert they’re at. It’s a fantastic feature for brands and online stores to take advantage of and gives followers a reason to check back frequently. We talked to our social media expert here at Threadless and she gave us some awesome ideas for how to use Instagram Stories for your online store’s social! 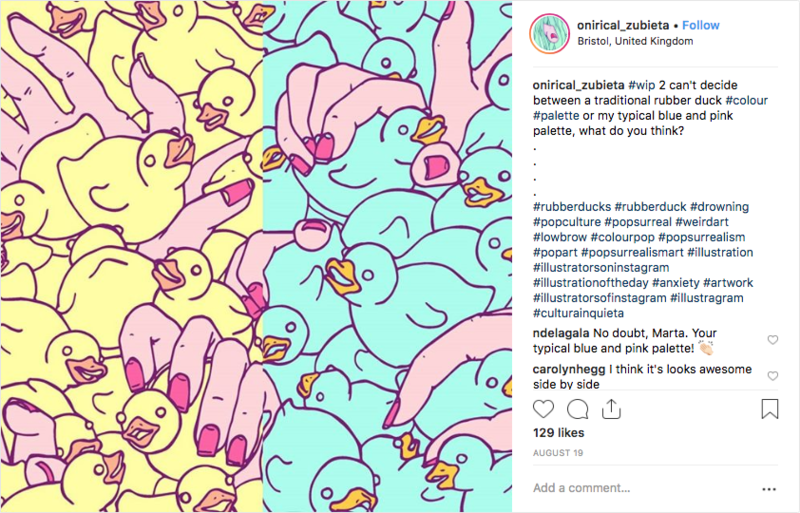 Artist Zubieta posted a side-by-side image on Instagram to get her audience involved in voting on which version of this design she should go with. This would have been a great poll to also run on Instagram stories where people can vote on a color! Birchbox uses awesome custom illustrations for their Story Highlights. They all tie together to create a cohesive look for their brand. Instagram Highlights are those little playable circles you see on someone’s Instagram profile. They’re a way of archiving your Instagram stories into content buckets even after they’ve disappeared from public view after 24 hours. Get creative with these! Illustrate and create custom illustrations of your own – this is a great way to tie them into your brand and to make them look fun. Then pick interesting themes for each content bucket. You can use one to feature snippets of your blog content, one to feature art from a new Shop collection, one to show your WIP, giftable items for the holidays, etc. 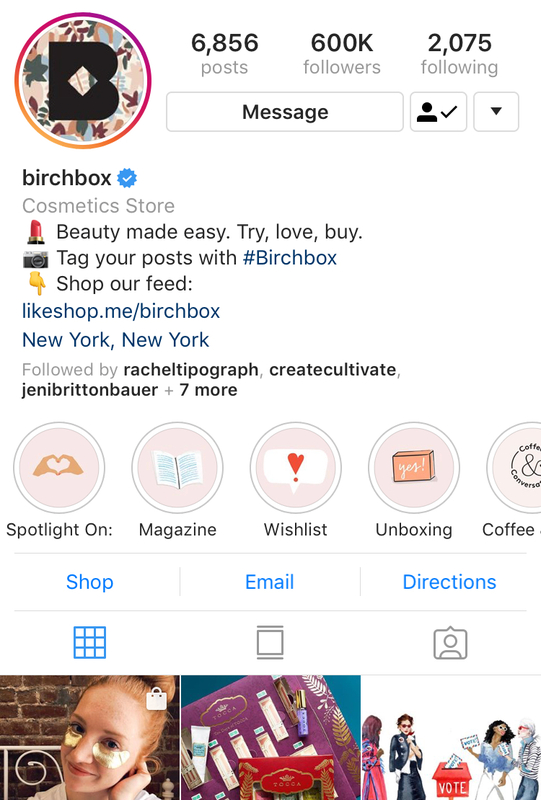 In the Birchbox example above, they feature content buckets to feature content from their magazine, “Unboxing” to feature what’s in the newest Birchbox, “Coffee & Convos” where they take Instagram Live interviewees and have them answer questions in their Highlights, and more. One way to keep people checking your Instagram story (as well as to keep yourself consistent about updating your Story) is to give them something to look forward to! Create a weekly series you can really make your own. Perhaps it’s a #tbt of visiting old drawings, “Sketchbook Saturday” where you show off a little bit of your sketchbook, “Which One Wednesdays” where people can vote for your next designs, etc. The best part? You can then take these series and make Instagram Highlights out of them! Take advantage of user-generated content by featuring pics taken by fans who have tagged you in photos where they’re wearing/using your product. It’s good etiquette to ask permission first before featuring them, but this is an awesome way of showing your fans some love and showing that you appreciate them. Do you have a blog of helpful tips, or just for fun? Your story is a great place to announce that you’ve published a new post! Share images teasing the content, or perhaps show snippets of helpful tips from the blog itself. While you need 10,000 followers or more to get the nifty “swipe up” feature on Instagram Stories, you can always play the “Link in Bio” card and provide a link on your profile for people to click on. Do you have a table at a comic convention? Are you live-drawing at an event? Use Instagram stories to document it! Use your story to feature the best cosplay you see if you’re at a comic convention, or utilize Instagram Live to show off your artistic process while live-drawing. Running low on those awesome stickers you’re selling? Feature them in your story and say, “Only X stickers left! Get ’em at my booth while you can!” There are endless ways to show your following what cool things you’re up to that they might appreciate. Nice and too much informative post just get and thanks for sharing tip about using instagram stories that must helps me for doing business.